Given the break-neck pace of the earlier couple days, Matt and I decided to approach Sunday in Paris a bit more sedately. Thus, before heading out for the day, we highlighted only a couple of interesting attractions given our relaxed outlook to the day ahead. First, making the cut, was the Basilica of the Sacred Heart, because Matt had yet to see it and since it was so close to the hostel, it only made sense. 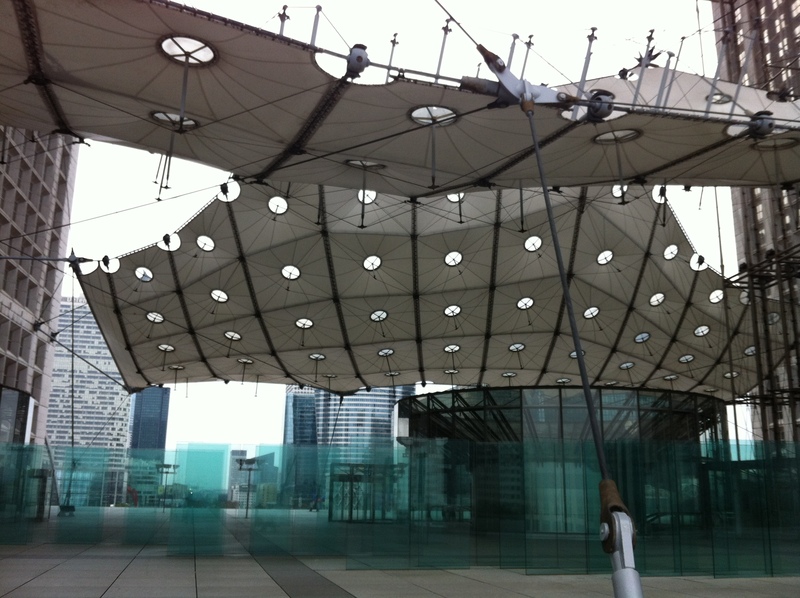 Second, having seen the Arc de Triomphe we thought it compelling to visit its bigger, more modern brother, the Grande Arche in the La Défense business district. Hatched over the usual morning coffee and croissants, our plan for the day was all set and so were we. In order to reach the Basilica from our Hostel we had to make our way past the Anvers metro stop and head north on Rue de Steinkerque, a small cobblestone side street. The route is lined with souvenir shops and little cafes. Unlike my Friday trip through this area, today there were several gentlemen, evenly spaced at a distance, with tall cardboard boxes setup in the middle of the closed-off street. On top of each makeshift table they were playing a version of the shell game, with small black disks, one of which is marked underneath with a white dot. Operating each of the half-dozen or so games was one of many seriously shady looking individuals. Opting not to lose my lunch money again in the shadow of the Basilica, we pressed on, only observing. Montmartre was much busier this time with many more tourists, panhandlers and Senegalese immigrants illegally selling trinkets on the steps. At one point a small contingent of police came walking leisurely around the corner, before which, only seconds earlier had several peddlers quickly bundled up their wears in blankets and hauled out of there with lightening speed. Probably the real highlight of this visit to the Basilica was a middle-aged male musician playing the harp. For several minutes, Matt and I sat on the stairs of the Basilica mesmerized by the music. This is one of those times when my senses were so profoundly overwhelmed by the environment that I was nothing short of paralyzed in blissful enchantment. 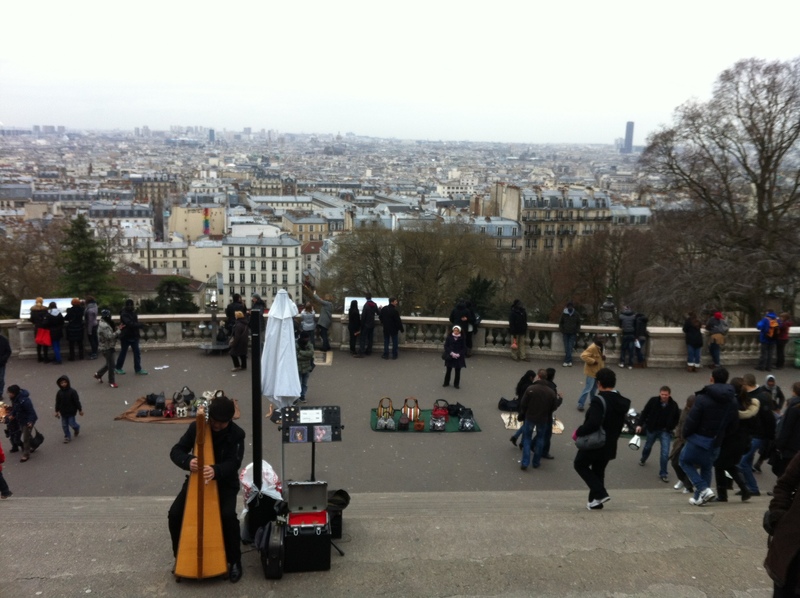 Reluctantly, we pried ourselves away from the incredible Montmartre view and from the beautiful music and made our way back down to the metro. On the way, we noted that several of the street’s side stalls were selling winter scarves, a fact that we would later take advantage of for souvenirs and gifts. 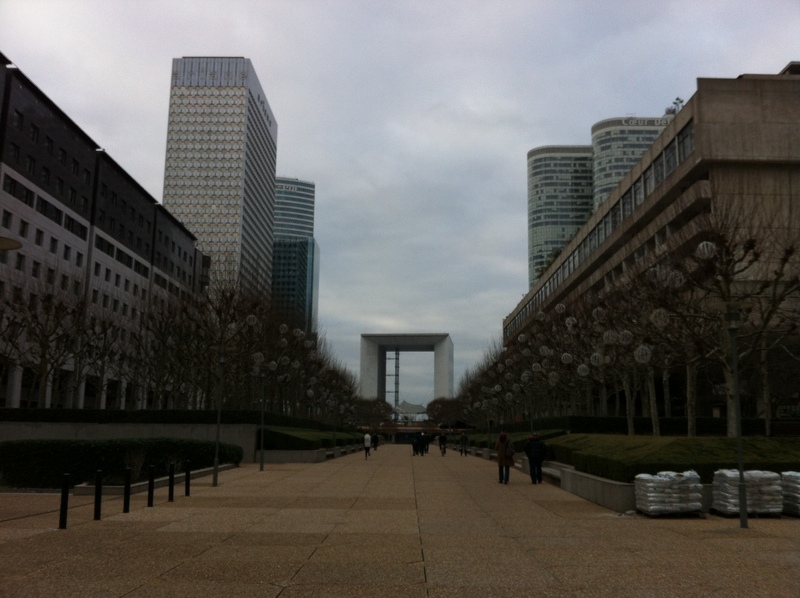 Within about thirty-minutes we had made our way through the subway system to La Défense and had exited out into the empty plaza at the foot of the Grande Arche. This is one of those monuments that is so big you find it unrecognizable when you are up close. Effectively, the structure is a cube-shaped office building, now housing government offices on the two sides and an exhibition hall at the top. 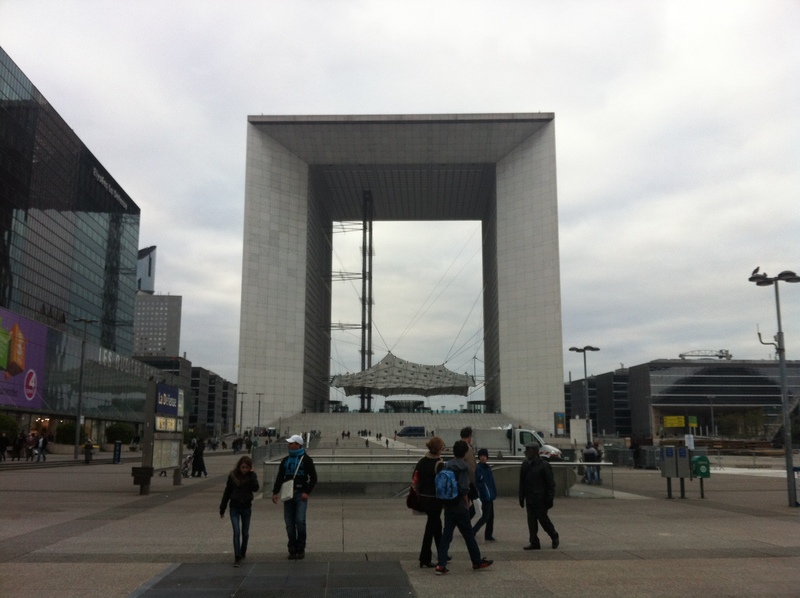 Though technically outside of Paris, the Grande Arche lines up with the Arc du Triomphe, the Champs Elysees and ultimately, the Louvre. With our stomachs growling, we started looking around for a restaurant or café in the weekend ghost town of the business district. 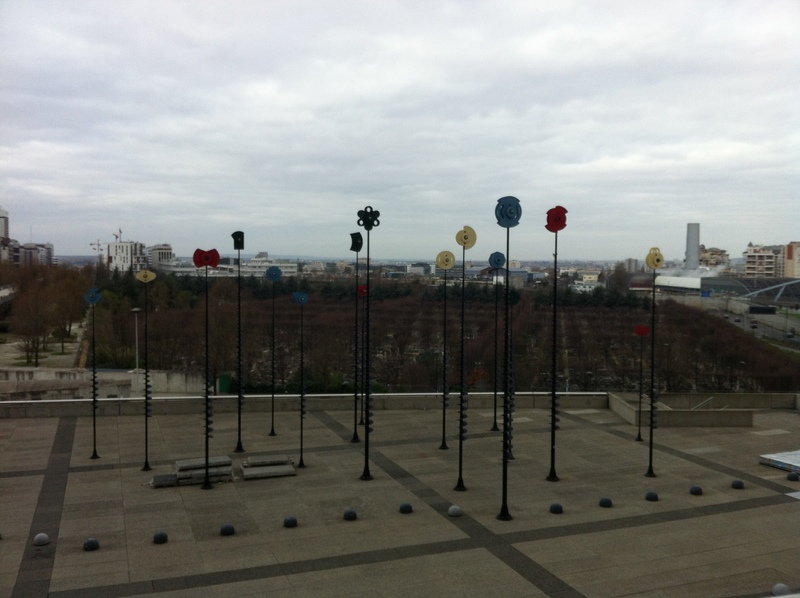 Fortunately for us, there happened to be one restaurant open just off to the left side of the Grande Arche, aptly named Café Bistro de L’Arche. Their lively group of waiters made up for the folly of those at the restaurant next to Notre Dame from the day before. Giving us a laugh, they even commented that Matt and I looked like brothers; it must have been the scraggly beards. Surrounded by the all-glass terrace, we relaxed into a long leisurely lunch of Jambon-Buerre, purée of vegetable soup and two enormous plates of French fries. Accompanying this feast, we appreciated a bottle of Sancerre and finished off the meal with some incredibly girly looking cappuccinos, complete with whipped cream. 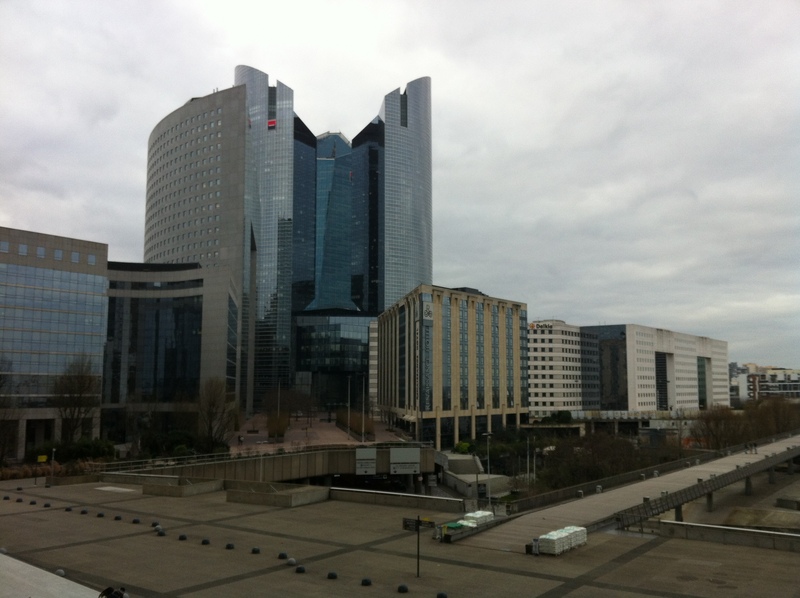 Fully rested and waddling out of the restaurant from our long lunch, we resumed our tour on foot of the La Défense district, which is probably the most interesting business zone I’ve ever seen. 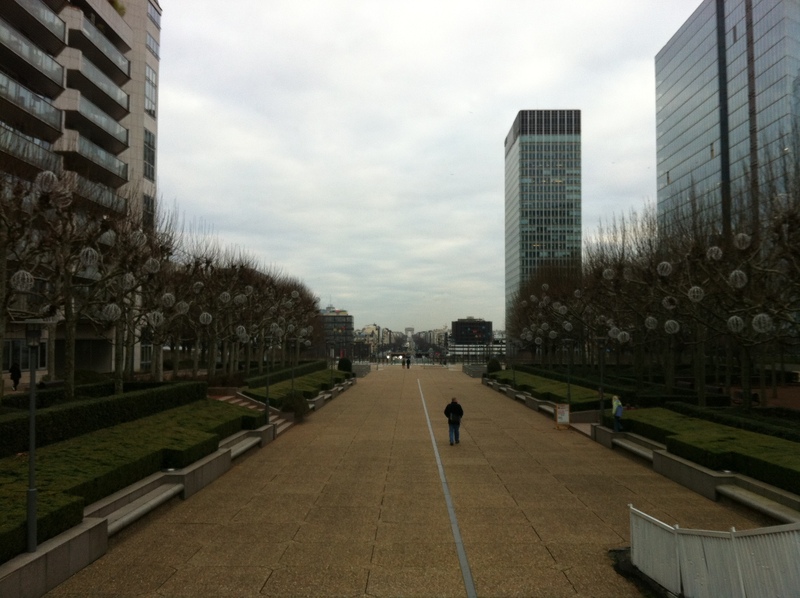 The broad pedestrian walkway leading from the Grande Arche back in the direction of Paris is flanked on both sides with anything but cookie cutter office buildings; each has its own unique and modern architectural design. 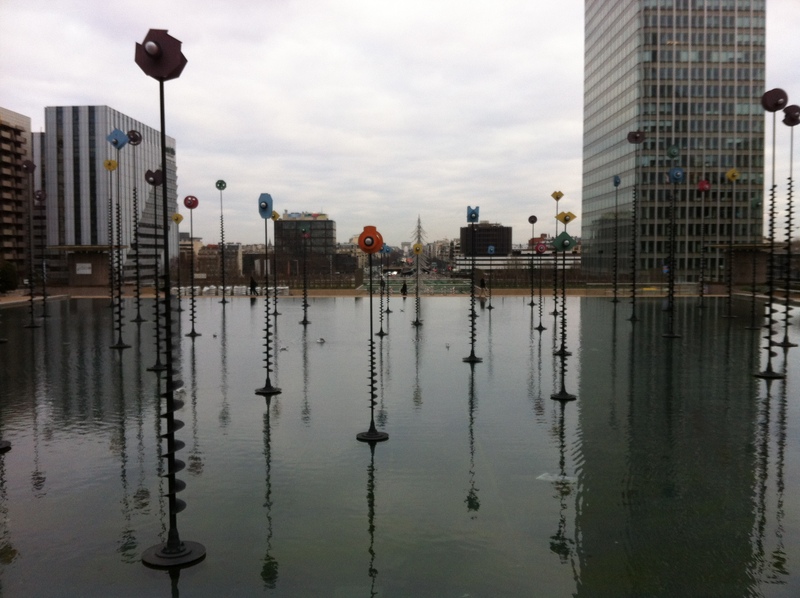 These incredible buildings are accentuated by several giant installations of modern art prominently placed throughout the plaza. Additionally, there are many water features, including fountains, waterfalls and reflecting pools that add an extra level of aesthetic beauty and soothing ambient sound. I can only imagine what a great place this would be to enjoy your lunch breaks in the spring. Once we made our way from one side of the long plaza to the other we picked up the metro and made our way back to the hostel. Continuing the theme of our lazy Sunday, we stopped at the market down the street from the hostel, where we were now regulars, and resigned ourselves back to the Parisian balcony where we washed the afternoon away with fine French cheese and wine. Sometime after sunset one of our roommates, Lucy from Mexico, returned to the room after her day exploring the city. We chatted with her for a while before deciding that the three of us should venture out in search of something for dinner. At this point Matt and I had already settled our minds on the idea of Chinese food and were ready to hit up a little place I had seen by the train station while looking for Melissa and Jovanka. Lucy was game, too, so the three of us hit the street, making it to the restaurant just before their ten o’clock closing time. Now here is what I think is an interesting difference between Chinese restaurants in the US and in Paris. In America we are used to either sitting down to service in a Chinese restaurant with white tablecloths, hot green tea and endless menus or to self-service with a buffet. I noticed at several different places in Paris that Chinese is something in-between these two worlds, where the food is displayed in glass cases, buffet style but not self-service; you make your selections from the counter and the proprietor dishes it up. Regardless of how they do it, the food was full of spicy delicious goodness, perfectly accompanied with Tsing Tao the meal transported me straight back in time to my neighborhood Chinese restaurant in Richmond, Virginia. With full bellies and another successful day under our belts we made our way back to the hostel to wind down our night, finishing off the wine we had and enjoying conversation with our roommates. Though a much slower day than the previous, it was a welcome change of pace to the hectic, non-stop life of being a Peace Corps Volunteer. Knowing that the second semester of school was only a week away we were happy to take full advantage of this well-deserved vacation.